On March 2 and 3, our Treble Choir took a trip to Chicago via South Bend. 30 singers and 8 chaperones joined Mrs. Pierson, Mr. Busarow, and Mrs. Hartleroad for a jam-packed weekend that included a clinic with Notre Dame Children’s Choir Director, Dr. Mark Doerries, an overnight stay at the University of Notre Dame, and a musical exchange with Anima (the Glen Ellyn Children’s Choir) and Youth Chorus of the North Shore. 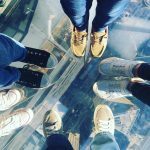 Our singers also had an opportunity for some sightseeing, including a visit to the Skydeck at Willis Tower and dinner at Navy Pier. These experiences are so valuable for our singers– not just for the music education component, but for the life experience, as well: traveling with friends, staying overnight and visiting new places.